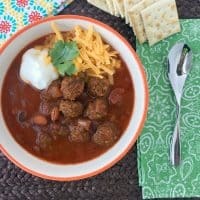 Easy meatball chili recipe that can be made in the slow cooker or on the stove top! If you will be making your meatball chili in a slow cooker then begin with a skillet. If you will be making it on the stove top instead of the slow cooker then start with a large pot. Add the olive oil to the skillet or pot. Add the onion, green pepper, garlic, parsley and jalapeño peppers (if using) and cook over medium heat, stirring occasionally, until onions are translucent and fragrant (about 5 minutes). Remove from heat and add the chili powder, cumin, sugar, oregano, salt, pepper and cayenne pepper. Stir until combined. Next add in frozen mini meatballs and stir again to mix well. To your pot or slow cooker, add the tomato juice, diced tomatoes, tomato sauce, tri-bean blend and pinto beans to either the skillet or slow cooker, depending on which you are using. If using the stovetop, bring to a boil, then reduce heat to medium-low and simmer for 2 hours. In a slow cooker, cook on low for 7 to 8 hours. Serve warm and top with cheese and sour cream or greek yogurt.